Perhaps it is the challenge of rockhounding that is so satisfying: finding the Petoskey stone hidden among beach stones — or maybe it’s the environs. And thanks to the glaciers that covered our region more than 10,000 years ago, there is an extraordinary array of rocks to be found in Michigan — both in variety and age, said Milt Gere, geologist with the Michigan Department of Natural Resources. One of the most sought-after stones is one many from the Petoskey area will know quite well: our state stone, the Petoskey stone. Petoskey stone — The Petoskey stone was born as coral approximately 400 million years ago, when a shallow sea covered Michigan. Over time, the coral fossilized and now washes up on beaches and peeks through road grades across Northwest Michigan. “I can find them in driveways, in parking lots, and everywhere there are rocks,” says Feenie Volante, Kewadin resident and subcommittee member of the Antrim County Petoskey Stone Festival. “People find them when the stones are wet on the shores of rocky beaches.” Volante recommends letting wet stones dry in order to train your eye to find the stones. 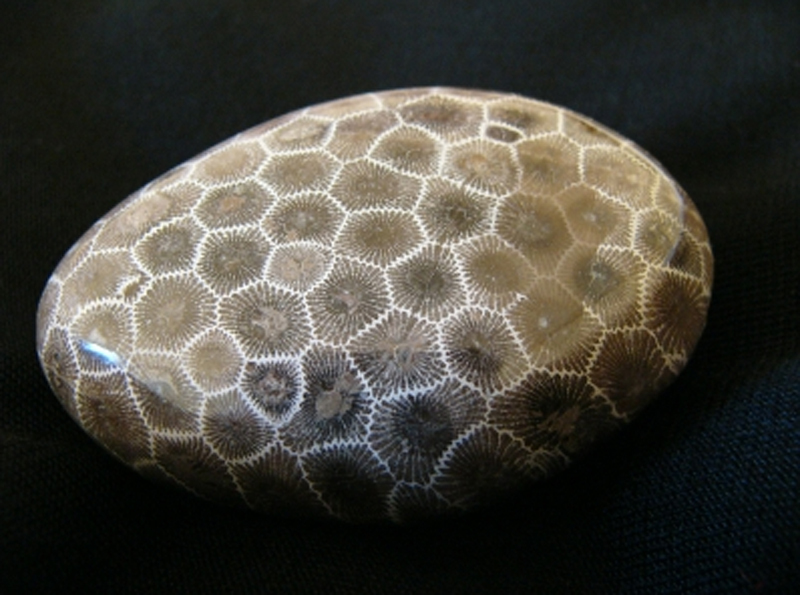 Legend has it that the stone was named after Chief Pet-o-se-ga, whose name meant “rays of rising sun.” It makes sense: the Petoskey stone’s interconnecting patterns look like little sunbursts. Leland Blue — Not all gemstones found in Michigan are formed naturally. The Leland Blue was slag — considered a worthless byproduct from the iron smelted by Leland Lake Superior Iron Company in Leland during the 19th century. 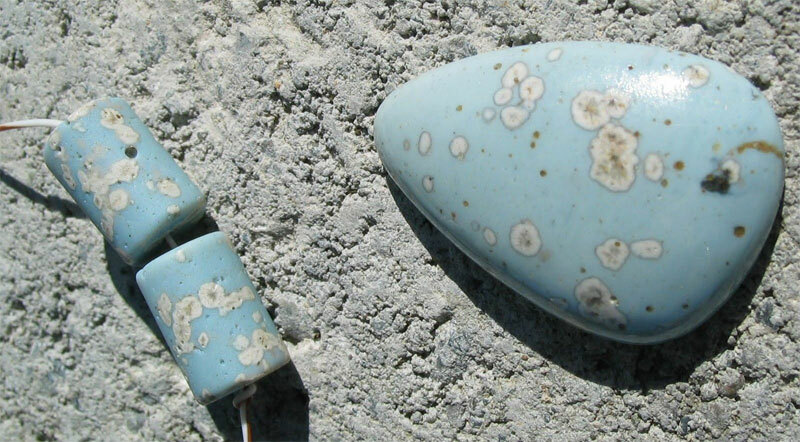 Find the stone, which ranges in color from a gray-blue to brilliant turquoise in the Leland area. It also has been found on beaches near Elk Rapids, said Gauthier. 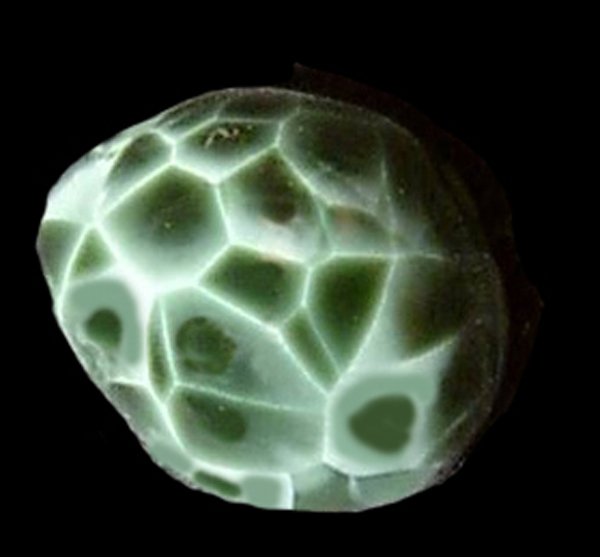 Greenstone — Michigan’s state gem, the greenstone, was formed in gas bubbles within basalt. Basalt is a volcanic rock, formed in Michigan in part during the Midcontinent Rift approximately one billion years ago. As the Earth’s crust separated, magma welled up from beneath the crust. Rocks formed from this magma gave Michigan its valuable deposits of copper and silver — and its state gem. You will recognize the stone, approximately the size of a pea, by its green turtle shell pattern, said Gauthier. Agate — Another gift from the Midcontinent Rift is the Lake Superior agate. Like greenstone, agates formed in the gas bubbles of basalt by the layering of quartz stained with iron. 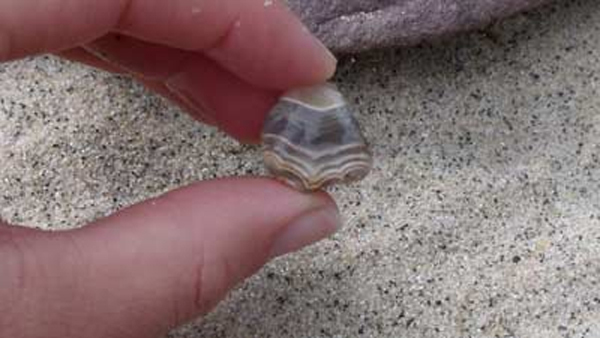 Karen Brzys, who curates a museum called the Gitche Gumee Agate and History Museum in Grand Marais, shared a few tips on what to look for in hunting agates on the beaches of Lake Superior. When possible, walk toward the sun, she said. During midday, situate yourself so that the sun glitters through the rocks — because you are looking for translucency. 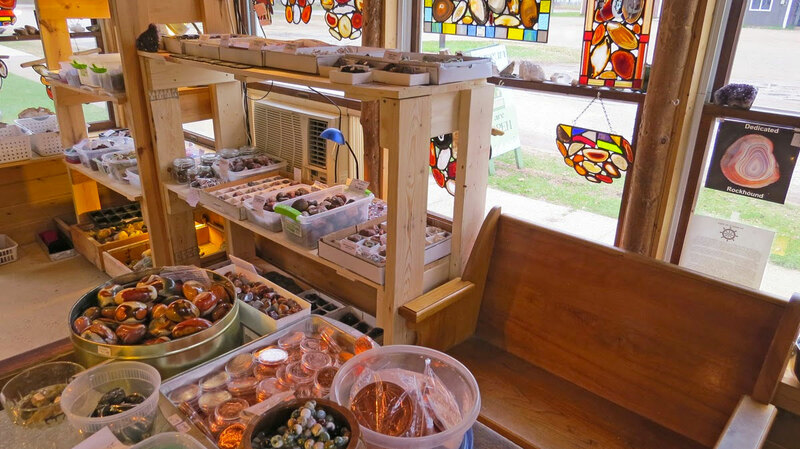 “If you’re a beginning hunter, most agates are easiest to find that way — and the good agates are translucent,” she said. Wherever you are collecting, take care to note who owns the land. Federally- and state-owned land have certain collecting restrictions, said Gere. Otherwise, simply enjoy the hobby. “It’s a cheap hobby. It gets people outside and into nature,” said Brzys. And it’s a part of nature you can carry with you.